Now you can get my Daily Moon Alert plus two Daily Horoscope signs delivered to you personally every day. For $2.99 a month - you get the Daily Moon alert plus two horoscope signs by e-mail every morning just past midnight Pacific Time. (Sun and Rising Signs? His and Hers?) You can change the signs whenever you like. A bargain! For $4.99 a month - you get the Daily Moon Alert plus two horoscope signs by text message at the time you choose in your time zone. You can change the arrival time of the texts or choice of signs whenever you like. You also get a "real time" Moon Alert. 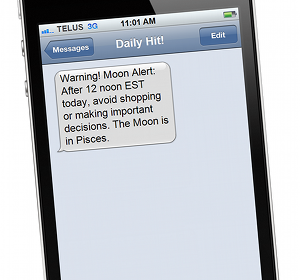 This means, one hour before the Moon Alert begins, you get a warning "reminder" text to let you know you have only one hour to shop or finish important business. Note: text message subscription is only available in North America. Note: Because a text message will be immediately sent to this number as part of the registration process, please have your phone ready to respond.